Eve van de Beek has been with PARDS since 2013. She started as a volunteer and began by cleaning tack and our rider boots. With a love for horses, she began taking lessons and continued volunteering in the barn. 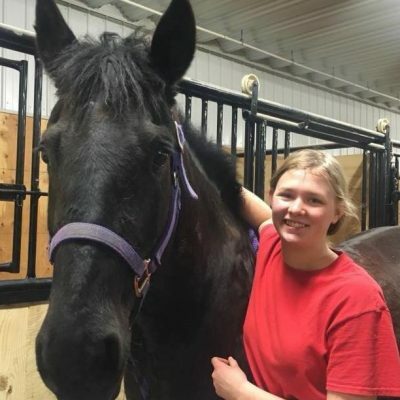 Showing a fantastic work ethic and a passion for learning more Eve was asked to join the team in September of 2018, as the Barn Lead/Instructor. This involves making sure horses are ready for lessons, stalls are maintained, as well as feedings and helping new volunteers when they came in to volunteer. Eve is a riding instructor in training and is now teaching a few therapeutic and public lessons with some of our beginner riders as part of her training and continues to keep busy in the barn. She is certified at rider level 2 and will soon be challenging level 4.